Up for sale we have a very special piece for anyone that loves Mopars. This is a 1970 Dodge Charger V Code. That's right a factory 440 Six pack car, and this one features the matching numbers block and transmission. It's done in its' factory color schemes and is believed 1 of only 3 or 4 ever made this way. This car was Rotisserie restored and is sure to impress. It sports one of the best bodies we've ever seen on classic car. All the hood, trunk, and door gaps are near perfect with the fit of all the panels also being close to perfection. From every angle you look it is straight as an arrow. The body is covered in Black, which is the factory color for this Charger. When you look closely you'll see the paint is stunning. It has a gorgeous finish that has been buffed and polished to a deep rich shine that's accented by the Red Vinyl Tail stripe. At the time of the restoration a lot of the chrome and stainless was replaced and is still in great condition. The things that were kept original like the gas cap and tail light trim are very nice and are a testament to how well this car was cared for. As for the glass, the windshield appears replaced with the side glass appearing to be original with it all being in excellent condition. To finish off the exterior it's sitting on a set of Black 15” Steel Wheels with Dog Dish Hub Caps and Firestone Wide Oval Tires. On the inside, it follows suite with the exterior being done in Charcoal/Black which is also the factory option. It does have the front bucket seats and all the seat covers appear replaced along with the padding. The console appears to be original with some light aging, but the door panels, carpet, and headliner all appear replaced and are like new. Looking at the dash you will see it has the wood grain trim to match the console and that it, along with the pad, is in excellent condition. The gauges are all working along with the dash lights and the clock! Even the original AM radio is working. To finish off the interior it has the wood sport wheel that's in great condition. Under the hood it sports the matching numbers 440 Block that is set up with the correct 2946276 Six Pack Intake with the correct style Holley Carbs. The 440 Six Pack engine is mated to the matching numbers 727 Automatic Trans. The rear also appears correct and is the Sure Grip 8 ¾” with 3.55 Gears. For exhaust it has the period correct manifolds with new dual exhaust. 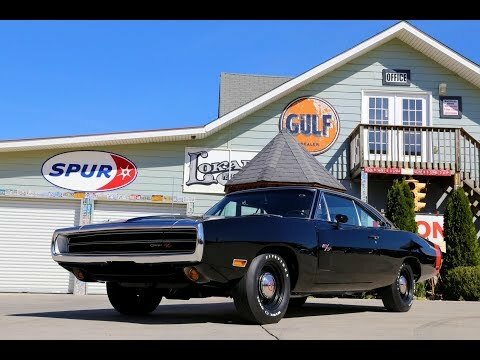 The brakes on this Charger are Power with Disc on the front with all new lines installed at the time of the resto. Also, a new gas tank and new lines were installed. Under the front end it has had all the components replaced from the ball joints to the bushings. When you get this Charger on a lift you are sure to be impressed with how great it looks. The floors and frame all appear factory and in phenomenal condition. This car is just as beautiful under it as it is on top and as easily one of the nicest restorations you will ever see.